In my last post I wrote about facing new challenges. That was over a week ago…sorry! Things have been busy here and it seems like I blink and a whole week is gone. We’ve been working hard but also enjoying this time of year. The holiday season is my favorite part of the whole year. It is always a great time of celebration and a perfect opportunity to make many family memories. I love how excited our kids get about each holiday, but how far do we allow our kids to “have fun?” Does God really care about how we celebrate different holidays? This brings me to our first challenge. The challenge of following Christ in the midst of common worldly traditions. To be honest, I really feel like we cheat when it comes to this challenge. We live in a place where most of the families hold the same view as us, so it isn’t really a challenge at all, but for most this one is going to be a huge challenge to face. This challenge isn’t easy for me to write about because I know a lot of people will disagree with me. Most people, even Christians, would look at this and say that I’m extreme, even crazy (I actually thought about calling this series “Those Crazy Christians!”). That’s ok. It is also ok if you don’t personally agree with me. Like I said in my first post, these are the things God has convicted me and my family on. I only ask that you have an open mind as I share with you what God has put on my heart. I posted a picture in the first Challenge post of my girls dressed up for Halloween. They LOVE to dress up, and we couldn’t help but indulge them. We did not, however, allow them to go out and trick-or-treat. We enjoyed a Fall Festival at a local church and bought them some new candy we found (called Unjunked…more about that coming soon!). 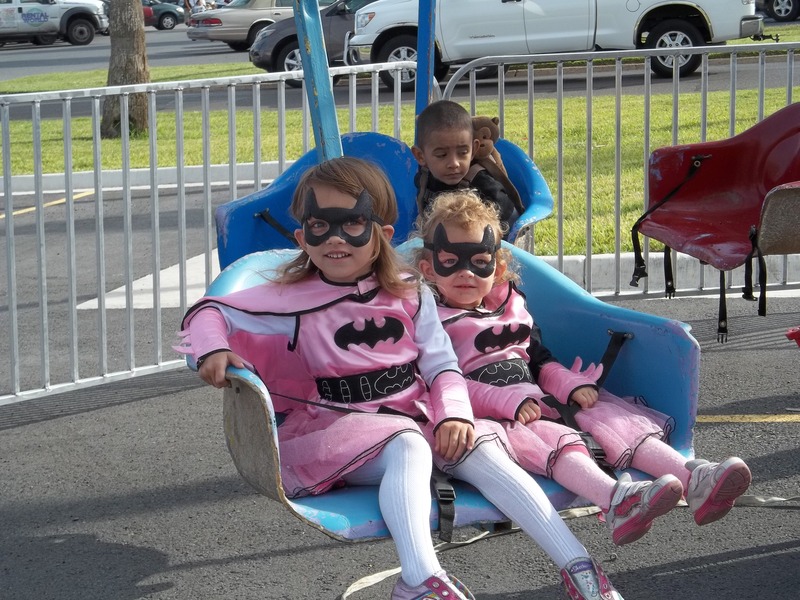 Emma and Paige at the Fall Festival. 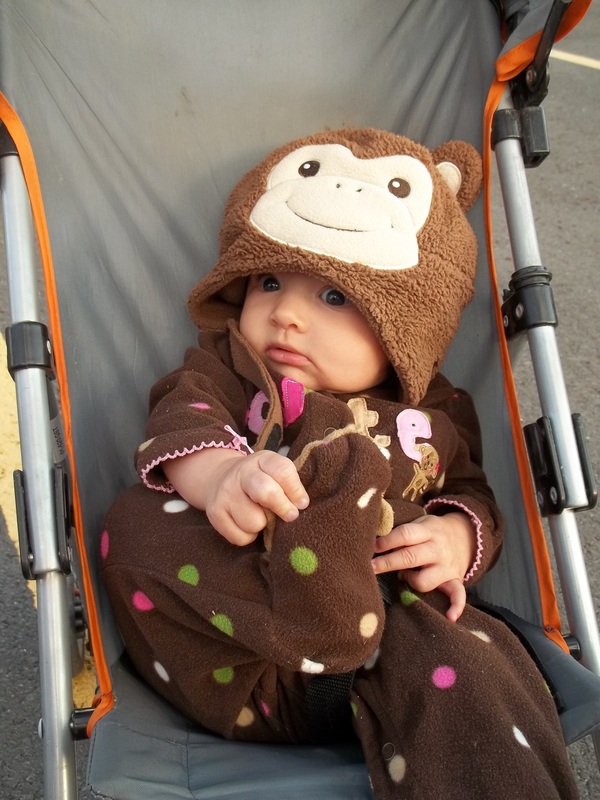 Olivia dressed as a monkey. So what’s so bad about trick-or-treating? Well, if everyone was dressed up as monkeys and Batgirls I would say nothing, but the whole point of Halloween is to incite fear. I understand people like to experience the rush of fear (I once loved watching horror movies) but the Bible teaches that God has not given us the spirit of fear. When I see kids (and adults) eagerly dressing up as monsters, ghosts, witches and the like I cringe at what we as a society are teaching our children. We are teaching them to embrace the scary things in life. We are even teaching them to like the things that terrify us. You may think this is good. You may think it gives your kid a leg-up because the world is a scary place and they need to be tough. I disagree. The world is a scary place, but our strength does not come by befriending it, it comes from the Lord. We must learn to turn away from the things of this world, to hate the evil that lurks all around us, and rely fully on Christ. So what about the other holidays? What about Santa and the Easter Bunny? We allow our kids to watch the movies and we even have Santa decorations in our house, but we are constantly reinforcing that they are not real. Why? For me it comes down to truth. We live in a world where the truth is bent, misshapen, deformed and rearranged in such a way that most cannot recognize it anymore. The Word of God has been lost between the lines of political correctness and we must constantly fight to bring it to light. I don’t tell my kids Santa isn’t real to squash childhood fun. I don’t do it because I think they will be traumatized later in life. I tell them Santa isn’t real because it’s the truth. I’ve debated it in my own mind but I simply cannot urge my children to follow the one and only truth (the Word of God) then convince them that a magical, fictional man is real. Even more so it breaks my heart to think of my kids putting their faith in someone who is not real. After all, faith is the belief in the things we cannot see, and our faith should be reserved for Christ and Christ alone. So, what do you do? Your friends and family will think your crazy. Your kids will probably be sad and may even get made fun of. Is it worth it? In my opinion, following Christ is always worth it. It is worth the pain, the ridicule, the looks of pity for your poor, poor kids. It is worth it because He is our truth and He deserves our obedience. A lot of people will say I’m stretching it, making a big deal out of a little fun. A lot will even look back at their own childhood and remember trick-or-treating or putting cookies out for Santa and think it didn’t harm them any so it won’t harm their children, but Satan is tricky. He is a deceiver and he will do whatever he can to convince you that one little innocent, fun-for-the-kids lie won’t hurt. Satan will slip through the cracks of childhood fun and begin to take root in our families. He will nudge his way in via Santa and a giant bunny and plant the seeds of dishonesty and compromise in the hearts of our kids. Yes, it is just a little thing. Yes, most kids enjoy these things, but I don’t want my family and my kids to be like most people. I want them to be like Christ. I don’t want us to drift into a sea of compromise and complacency only to wake up one day and realize we are drowning. I challenge you to take this topic to the Lord. If your kids already believe in Santa and the Easter Bunny, I challenge you to tell them the truth. I know it will be hard, but you can never go wrong by turning their focus to Christ and there are a lot of fun ideas of how to start new traditions that do just that. Last year we had our girls “write” letters to Jesus to let Him know what they want to give Him in the coming year. This year I think we are going to do the Truth in the Tinsel book and crafts as well. You can find a lot of other really great ideas here. 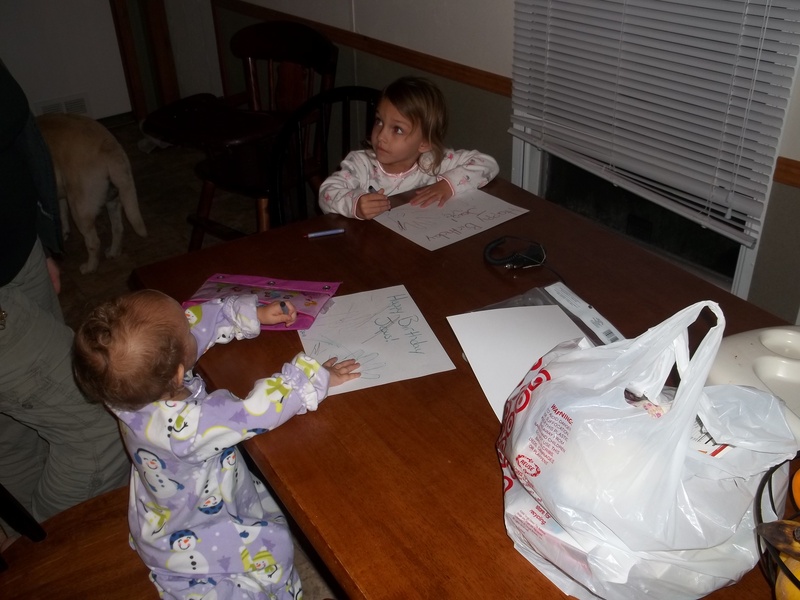 Emma and Paige “writing” their letters to Jesus, Dec. 2011. Of course, they wern’t actually old enough to write so they had a little help. A matter of fact, a lot of the ideas listed on the page linked above sound like so much fun, and are so meaningful, they make Santa look downright boring. Hi Phillip and Jessica, This is my first time reading what you write and wow you get a huge AMEN. And you could easily do more preaching but wait til I get back. Keep up the good work. I agree totally. I raised my children the same way. I was radical. Alternatives are great. God bless you. Keep up the good work. I am so proud of you. I have the same conventions. I raised my children the Same way. They turned out blessed. God bless you.